the stunning panoramic views will! Laguna Beach hiking is a completely different way to enjoy this beautiful seaside town! you're ready for an adventure on the Laguna Beach hiking trails! All you need to do is turn your back to the sea (if you can!) and face the hills. If you look carefully, you will see the trails criss-crossing the upper-ridges of the hillsides. 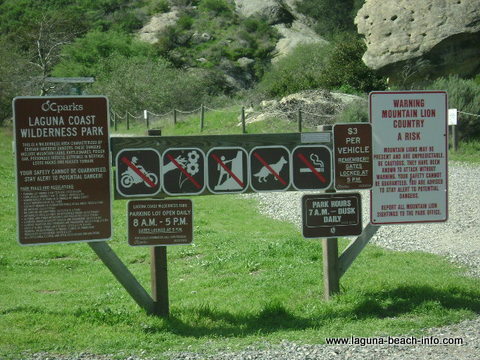 Most Laguna Beach hiking trails are accessible for the public to hike, mountain-bike, and trail-run. You are guaranteed great cardio-exercise and if the hill climbs don't leave you breathless, the stunning panoramic views of the coast will!! There are many different trails which are each appropriate for various conditioning levels. Some trails are gentle with only minor slopes and other hiking trails are filled with challenging vertical inclines. Make sure to pick a trail that is best suited for your physical condition, stamina, and motivation. * Water Tank Hiking Trail – this is a challenging vertical climb, not for the faint of heart! But the breathtaking views from the top are worth the effort! 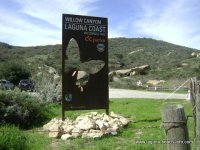 Perhaps the most visible sign of the Laguna Coast Wilderness Park and the incredible hiking trails it contains is the public parking lot at Willow Canyon. This lot is located on Laguna Canyon Road just south of El Toro. Public parking here costs $3.00 per vehicle, which is paid for at the automated meter located in the gravel parking lot. The parking lot is open from 8am to 5pm and will give you great access up through willow canyon up to connecting trails that will bring you to Bommer Ridge Trail and Serrano Ridge Trail. Use this parking lot as a staging point for some of the best hiking trails in North Laguna Beach! * Toovet Hiking Trail – gradual climb, great views! * Valido Hiking Trail – some steep climbs, several single tracks! Getting lost is only fun when you can find your way out! While planning your trip, be sure to visit Franko's Maps to get a comprehensive trail map of the South Coast Wilderness area!! Frankos Maps provide extensive information regarding trail locations, elevation, wildlife, and rules of the trail! Every time I take visitors and locals out on a hike, I bring along one of Frankos Maps! There’s always a new trail to explore, and Franko helps you find them! What should you bring for Hiking in Laguna Beach? Whenever your hiking in Laguna Beach, always make sure to bring plenty of drinking water, sunblock, a hat or cap, a light sweater, and good shoes!! And remember, these are wilderness areas so its common to come face-to-face with deer, rabbits, red-tailed hawk, and possibly some other surprises!! 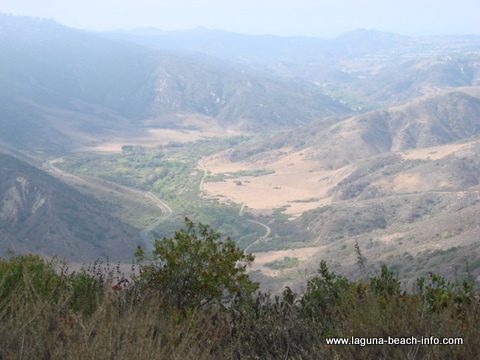 Laguna Beach hiking trails will not leave you disappointed! Do You Prefer To Go Fast? If mountain biking is more your style, you can rent great equipment at Rainbow Bicycle Co. RBC has been serving Laguna Beach cycling enthusiasts for over twenty years. Their helpful staff can get you into the gear you need and keep you up-to-date on the current trail conditions. 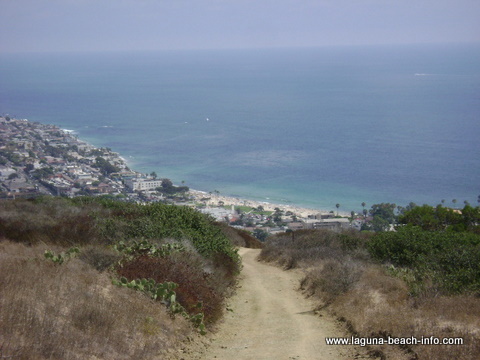 Add Your Favorite Laguna Beach Hiking Trail or Hiking Story! 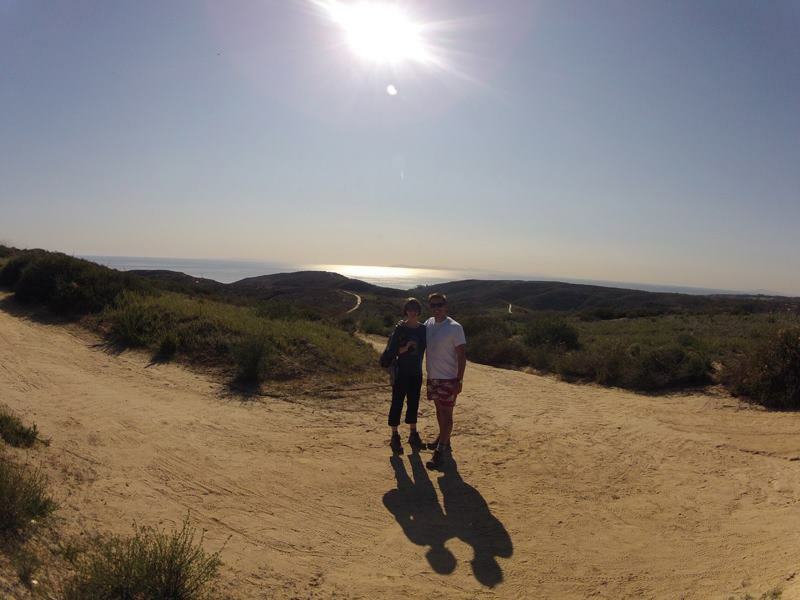 Share Your Hiking Story or Favorite Laguna Beach Hiking Trail! 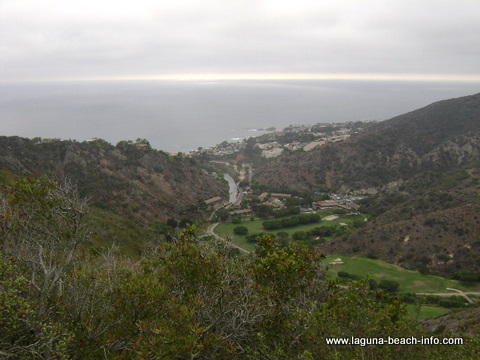 Do you have a favorite hiking trail or fun story about hiking along the Laguna Beach coastline? Share it!